Last year 54% of Americans left a total of 662 million vacation days unused. Don’t be one of those people. It’s time to take a well-deserved day off – and crush it. Take off Friday and spend three days in Abingdon, where it’s always play time. Check in to one of Abingdon’s adorable downtown vacation rentals like Park Street Guest House, then leave your car there – you can walk to great restaurants and entertainment, all within a few blocks. Abingdon is the trailhead for the famous Virginia Creeper Trail, a former railroad line that used to carry coal and lumber down from the mountains of SW Virginia. 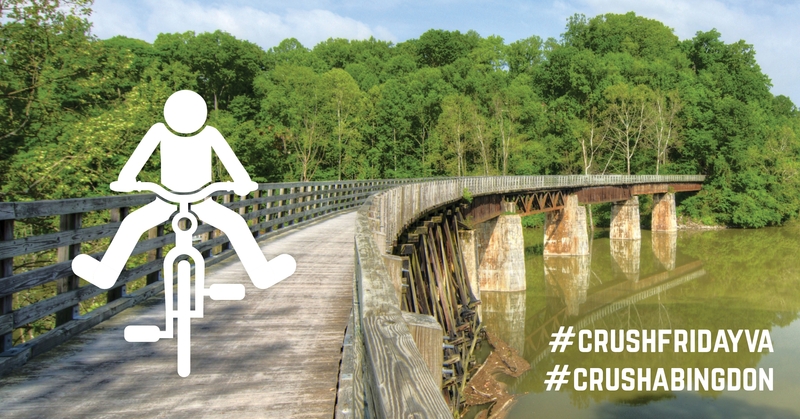 Now it’s a popular biking and recreation trail that travels 34 miles through beautiful mountain scenery, over dozens of trestle bridges. Virginia Creeper Trail Bike Shop can outfit you with a bike, helmet, and water bottle. Best of all? They offer a shuttle package that will drop you off at Whitetop Station, the highest point on the trail. You’ll coast downhill for 17 miles through Jefferson National Forest to Damascus, VA. From there, you can pick up the shuttle back to Abingdon, or bike another 17 miles through rolling countryside. While you’re on the trail, stop by Abingdon Vineyard & Winery, a 50 acre farm winery located along the South Holston River offering tours and tastings, located just a short distance off the trail between Damascus and Abingdon. Friday evening, head to Wolf Hills Brewing for live music, craft beer, and food truck cuisine from Toni’s Hawaiian Tacos. Try the Wolf’s Den IPA or Martha Washington ESB (the first beer to be served at the Martha Washington Inn post-Prohibition), some of the dozen or more beers that pay homage to Abingdon’s 250-year history. Still thirsty? Walk over to The Tavern for a nightcap and take in the ambiance of this moss-covered building, constructed in 1779. Saturday morning, head to the Abingdon Farmer’s Market to mingle with the locals. Enjoy fresh-baked goods, coffee and browse the stalls full of local Appalachian-grown produce, meats, and products. Load up your climbing gear and get ready to explore some undiscovered gems. Don’t panic if you forgot something, local outfitter Highlands Ski and Outdoor Center has you covered. They’ll even loan you replacement gear if you have a problem covered by warranty, so you don’t have to miss a moment of your trip. There are two prime climbing areas within an hour of Abingdon. Hidden Valley Lake was recently reopened to the public, featuring nearly 500 routes, a combination of sport and traditional lines, including treasures like Tea Kettle Junction, loaded with 40 routes, almost entirely traditional climbs, including short-but-sweet cracks, cozy chimneys, and plenty of roofs and arêtes. East of Abingdon is Grayson Highlands State Park, one of the premier bouldering destinations in Virginia. With nearly 1,000 problems scattered throughout the park, there are enough routes to suit all kinds of climbers. The lofty elevation of the park’s bouldering areas, many more than 5,000 feet, also make Grayson Highlands a prime climbing destination during the summer, when temperatures render many popular routes in the Southeast off-limits. 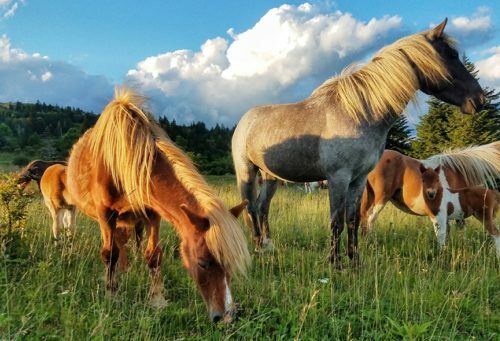 While you’re there, hike the Rhododendron trail to get up close and personal with the park’s famous wild ponies (look but DON’T touch, they might be cute, but they are wild). You’ll be hungry after a day of climbing, so carb-load at Papa Tom’s Cantina, a Cali-Mex eatery featuring signature margaritas and fresh entrees. Then catch a play at Barter Theatre, the oldest professional theatre company in the country. Don’t be fooled by the velvet seats and sconces, this theatre is welcoming to all, no dress code required. Throw on some jeans and stop by the concessions stand for a glass of wine or local beer to take with you in to the show. At intermission, be sure to check out the fascinating historical photos on the balcony level: the theatre was founded during the Great Depression, when the actors literally bartered theatre tickets for food. Tickets start at $20 for all shows, with performances 6 days a week in two stages. Wild ponies are common at Mount Rogers National Recreation Area. Sunday morning, head to Heartwood for a leisurely brunch. This artisan center is southwest Virginia’s artisan gateway, and filled with information on local crafts, music, and culinary products like Whites Mill stone ground grits. The restaurant’s Appalachian focus emphasizes fresh local ingredients. After a weekend of adventure, you’ll appreciate a mellow float trip with Adventure Mendota, offering kayak rentals on the North Fork of the Holston River. This Class I/Class II river is perfect for recreational kayaking; the water's gentle flow ensures your first kayak trip will be as good as your next ten. No experience necessary. If time allows, pop over to Bristol to visit the Birthplace of Country Music Museum and take a selfie on State Street, with one foot in Tennessee and one foot in Virginia. Head back to work Monday feeling more creative, more productive, and ready to crush the week ahead. 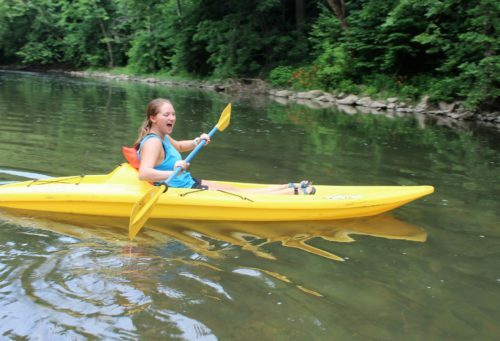 "Float the Fork" with Adventure Mendota for a leisurely time on the water.